Ever since North Korea announced the death of Kim Jong Il, the wailing has come nonstop. From the woman in black on television, who announced that the Dear Leader had slipped these surly bonds of earth, to those who have gathered daily since then to moan and wail and beat their chests in agonized sadness, the North Koreans have shown that they do public grief better than anyone else. And make no mistake: they have just begun to weep. 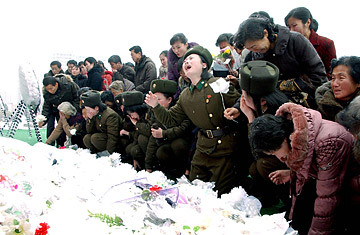 On Dec. 28, when Kim Jong Il's funeral takes place in Pyongyang, the masses will be bawling and howling. They'll cry like few men (or women) have cried before. As the rest of the world has watched these scenes, most people are asking a very reasonable question: Are these people nuts? After all, it's not as if they had been living somewhere else when tens if not hundreds of thousands of their fellow North Koreans died of starvation in the late 1990s, the direct result of the ludicrous economic policies put in place by the Dear Leader. They walked past the corpses every day. "Everyone knew what was going on," says Kim Shin-yong, who defected from the North in 2002. Nor are they unaware that thousands of others have been flung into the country's notorious political prisons, many for no other reason than being related to somebody who had somehow offended the regime. Yet out they've come, crying their eyes out for a leader who is a sure-shot first-ballot entrant into the Despots Hall of Fame. Why do they do it? The answer, as is usual in the Democratic People's Republic of Korea (DPRK), is complicated. Many psychologists who view these scenes from afar consider them legitimate. Raised in isolation and fed an unrelenting diet of personality-cult-driven propaganda for their entire lives, a people can feel rudderless and grief-stricken when they hear that Kim has joined his late father, the Great Leader Kim Il Sung, in the afterlife. Scott Atran, a psychologist at the University of Michigan, notes accurately enough that the people of North Korea were told from Day One that virtually everything they have came from the Dear Leader, "and they have no alternative form of reality." And mass grief, though particularly intense in North Korea, isn't wholly unique. Chinese of a certain age recall that when Mao Zedong died in 1976, many Chinese were shocked into tears that the father of their country was no longer with them. But as Jane Bolton, a psychiatrist, wrote last year in Psychology Today, "a lot of misunderstanding happens around the act of crying," and in North Korea, is that ever true. There are reasons other than grief that enter into play that, to put it politely, would not be a factor elsewhere. Cheong Seong Chang, a longtime North Korea watcher in Seoul, notes that mid-level party officials, if they are seen to be wailing louder than co-workers, "might get promoted." And it's what happens to that other guy  the guy stupid enough not to be wailing in public  that provides the real motivation. Scholars of the system in North Korea say that if you are out and about and happen upon a group of criers, you'd best be seen crying too  particularly if there are cameras rolling. As Lee Sung Yoon, a researcher for the National Asia Research Program, told CNN recently, "If you're not devastated by the news, you might get in trouble." North Korean defectors say you can eliminate the might from that sentence: the country, they claim, has a network of domestic informants that makes the old East German Stasi look like amateurs. The fact that the Dear Leader could preside over a famine like the one in the '90s and not have the regime even wobble shows just how tight a grip the government has on its benighted population. The question  almost unknowable from the outside  is, What happens behind closed doors? Are the Koreans still crying? North Korea watchers observe that there is less intensity to the public displays of grief this time than when Kim Il Sung, the founder of the DPRK, died in 1994. They further note that the population is not quite as ignorant of the outside world today as it was back then. Modern technologies (cell phones and DVDs from South Korea and China) find their way into the country these days. Thousands defected in the wake of the famine, and many figured out ways to get messages back to friends and relatives about what life is like in China  or in South Korea, if they are lucky enough to make it that far. Still, clues about what North Koreans actually think are maddeningly elusive. You take them where you can and try to fit them into the puzzle. Consider this: I spent a few days visiting a new university just outside Pyongyang about two weeks before Kim Jong Il died. The school is attended by elite kids, many of them connected to senior levels of government or the military. Some of the faculty and administration of this experimental new school  all of whom are foreigners  were on campus when the announcement of Kim's death came. I asked one person how the students had reacted to the news. Was there wailing, gnashing of teeth, rending of garments? "They were quiet, definitely," this person said. "But there was no crying." None? "No. None that I saw." Which was a relief to hear. The kids who attend this school are anything but stupid. They know a bit about the outside world, but they are also very much products of the regime. That there wasn't a damp eye in the house is not, frankly, what I was expecting to hear. Remember that the next time you see news footage of what one friend of mine in Seoul calls "the great North Korean wailing contest." Not everything is as it seems in North Korea, and they're not as nuts as they look.